both serious and whimsical. It will be growing. 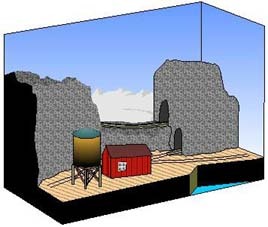 Jon Songøygard, who lives in Norway, has explored the use of a 3-D traverser in a shoebox layout in Two-Shoe Hill Mine. The layout is designed to fit the “standard” shoebox of 33x12x18 cm, and rolling stock would consist of a small Roco HOe locomotive and ore wagons. Jon explains operations this way: “The railroad begins within the Mine (upper left). This is also the operator’s spot to fiddle cars (or simply fill them with crushed minerals). From the mine, tracks appear in open air for a short stretch, before entering a new tunnel (upper right). This is supposedly the entrance to an unmodeled area where there’s a long “fork” track arrangement. Jon’s biggest innovation is on the traverser, where he’s incorporated vertical movement (on the slant — see cross-section A-A at right). The “mine” track is elevated about 3 cms above the tracks on the quay. Jon explains, “I’m not sure whether this has been done before (or whether it works), but I think it could be a great space-saver, not only here but also on micro layouts larger than this one. All in all, Two-Shoes Hill Mine packs a lot of action and innovation in a very small layout! A Classic Inglenook in a Shoebox! What makes the configuration possible is the small size of the four-wheel tram wagons plus the short wheelbase of the locomotive (here missing its superstructure). The capacities of the sidings are, from the front, 5,3 and 3 cars; and the headshunt (yard lead) holds a loco and 3 cars. The game begins with eight cars distributed on the sidings. The goal of the game is to select five of the cars at random (perhaps by pulling numbers from a hat) and then make up an outgoing train from those five cars in the sequence drawn. This simple sounding task can become surprisingly complex in very short order! John notes: “I am still not sure about the uncouplers. I presume that an uncoupler can be devised that cosists of a small platform that rises vertically between the tracks.” I’ve successfully used bits of transparent plastic as uncoupling ramps with this stock, but the curved sidings might be tricky! Experimentation will be required. To learn more about Inglenook switching games, go to the Shunting Puzzle Page. For more about John Hubbard’s work, see his website. I designed this surprising little shoebox for a friend who fondly remembers the “coal tram” in the basement of his high school many years ago. It’s a two-level plan, with a train coming in from the left at the higher level and ducking behind the cutaway building. In front, we can see a cutaway view of the cellar, with the incoming train visible through the cellar windows and the open coal chute. A very small portion of the ground floor is suggested at the top — shown as a purple band of color in the drawing. Built into the cellar floor 3 inches below ground level is a tiny tramway that runs from the coal bunker to the furnace room. It can be human-powered, by powering the little coal car with an underfloor motor block (like a Spud) and attaching a pushing figure. Or, if you prefer, the coal car can be pushed and hauled by a very small battery-powered loco. The shoebox is placed on its side, with the 7-inch dimension as its height, to accommodate the two levels (the shoebox is outlined in red in the drawing). Operation is simple and fun. The incoming train (a loco and one coal wagon) is loaded on the cassette and proceeds very slowly past the building and behind it, being visible from the cellar. The coal is unloaded through the coal chute, partly into the tramway car and partly onto the pile in the bunker. The delivery train departs, and the tramcar is pushed over to the furnace and dumped. Then it returns to the coal bunker, and the sequence repeats. The two roads were designed as Gn15 at ground level (1:22.5 scale on 16.5mm gauge), with Gn10 (1:22.5 scale on 9mm gauge) in the cellar. But really any combination of gauges can work well — including O and On30/O16.5 or On18/O9, or even HO and HOn30/OO9. Careful, stage-type lighting is essential to the success of this layout — the cellar should be somewhat dim and mysterious, while the “outdoors” should be filled with sunlight (that shines through the windows). Properly mounted, this little stage picture can provide a stunning effect! Jon Songøygard, from Arendal, Norway, has concocted the first dual-gauge, railway and tram (trolley) line to fit in a shoebox! Endal Street is set in the center of town, where the buildings are close together and the action is intense. It features a standard gauge (normal gauge) trolley line running in the street under wire, and a narrow-gauge railway delivering freight to the industries in the center city. Jon comments, ” I’ve found there’s not much room for turnouts in shoeboxes. Instead, on this plan I’ve substituted a removable sector plate and a train turntable. All traffic originates at the sector plate, which is also used as a “fiddle yard”. The tram/trolley car moves via the turntable to the station at the front, loads its passengers and returns via the turntable. The narrow-gauge freight traffic has to avoid interfering with the tram schedule. It waits in the center-track “yard” while the trolley is traveling through town. Then, when the car has departed, the little loco gets busy delivering freight cars, one at a time, to the industry on the back track and the LCL dock at the end of the station platform in front. There’s a lot of fun and many modeling challenges crammed into this very small space. Notice in Jon’s sketch that he has opened up the back of the shoebox top, so the operator can see what is going on inside. This is an essential operating ingredient, but it also provides a handy signboard to advertise the layout’s name! 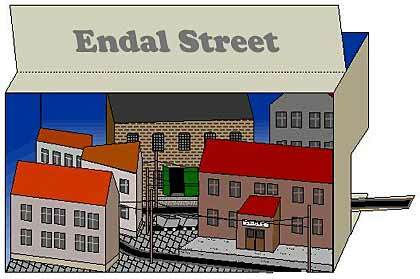 “Endal Street”, by the way, comes directly from the name of Jon’s home town.